HelpScribble's default output format is the classic WinHelp .hlp file. These files can be used on any computer running Windows 3.1 or later. Performance is excellent, even on slow computers. By choosing the WinHelp format, you will not leave any customer or prospect without easily accessible documentation. WinHelp is fully supported by Windows 3.1, 95, 98, ME, NT4, 2000 and XP. Windows Vista, 7, 8, and 8.1 can only display WinHelp files after the user downloads the WinHelp viewer from Microsoft. Windows 10 cannot display WinHelp files. If support for Windows Vista and later is important for your application, you should consider the HTML Help format. 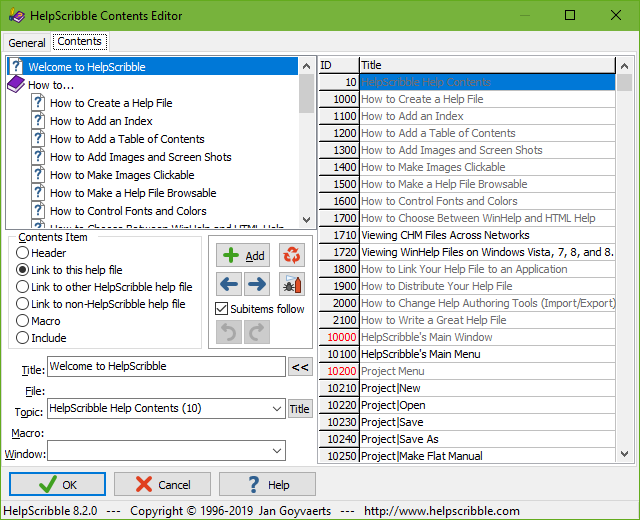 With the Browse Sequence Editor, you can create lists of topics that can be browsed using the <<< and >>> buttons in WinHelp. Browse sequences are most useful if your help file contains a reference section. You could create a browse sequence with all the reference topics in alphabetic order. You know the Chinese proverb which says that a good picture is worth more than a thousand words. 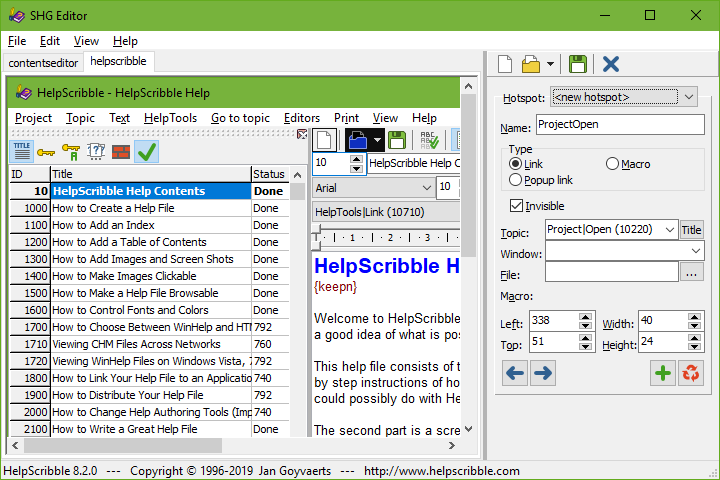 While any help authoring tool allows you to insert screen shots and other pictures, with HelpScribble's SHG editor you can make your pictures much more powerful. You can add clickable regions to your images that, when clicked, will show a help topic with more information about the area that was clicked on. New users will not know the name of all the features in your application, but they will know how to point at a picture. HelpScribble's SHG editor makes this very easy. If you have already made the screen shot (or whatever image you want to use), simply open the bitmap file in the SHG editor. If you have not yet made the screen shot, press Alt+Print Screen (to capture the active window) or Print Screen (to capture the entire screen). 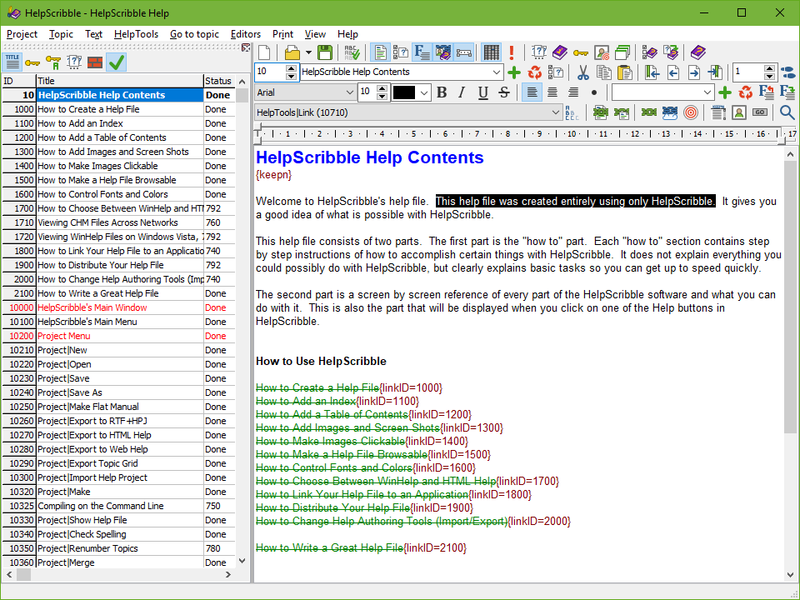 Then switch to HelpScribble's SHG editor and use Edit|Insert Bitmap. Either way, you are now ready to add clickable regions. To add a hotspot (clickable region), simply draw a rectangle on the bitmap with the mouse. Just like you would do in a paint program. Then you can set the hotspot's properties in the right hand pane of the SHG editor. Usually, you will only give the hotspot a name for easy reference later and select the topic it links to from the drop-down list. Add a few more hotspots, save the SHG and use HelpTools|Insert Bitmap to add it to your help project.